Loss cripples you, it settles a fog over you. It completely changes you. I remember looking in the mirror after I lost John and my reflection was a stranger. I couldn’t recognize who I was, let alone comprehend who I was going to be without him. I tried looking ahead, but all I knew, was what was behind me. The life we had. The life we were building and the plans and dreams we shared for our new adventure in marriage and creating our forever. Almost ten years later, I look at my reflection and I see me, well the new version of me. I’m forever changed, but I’m proud of my scars and my journey. I see that once I started focusing on each day and living to honor John and myself and not take a moment for granted, I started to really live. I honestly have reminders all of the time, after all we are human. We are not perfect and despite loss we can and still do lose site of what’s important. I learned it was ok to dream again, feel again, love again, be happy again. 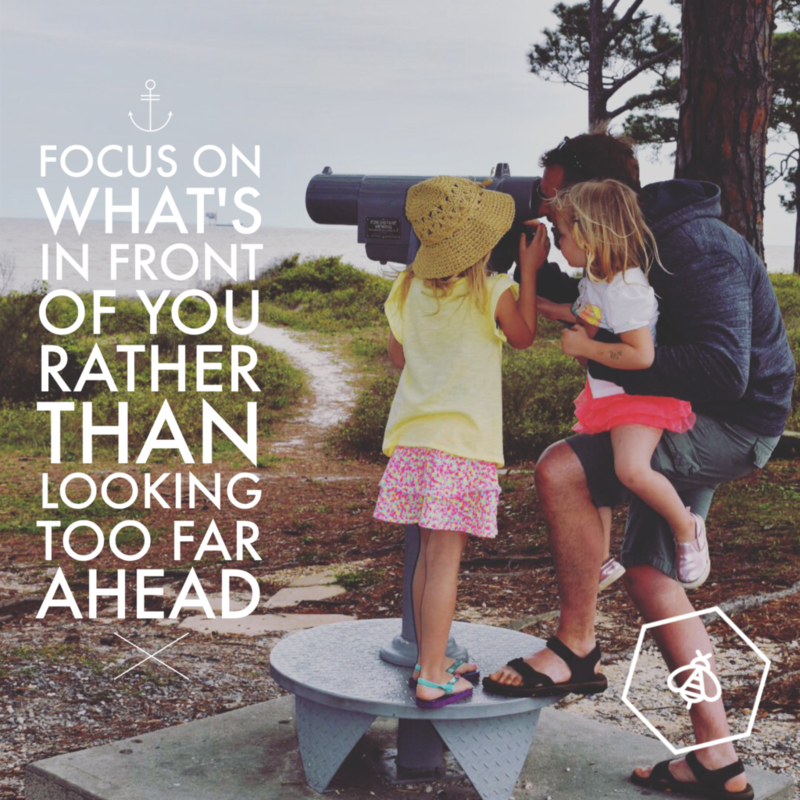 Focus on what’s in front of you rather than looking too far ahead. When I did this and lived day by day, taking pressures off of myself I started to be less afraid of what was ahead. I started focusing on the day and making it a good one and that overflowed into the next day…I began to find my joy again. New joy! It was not easy, I stumbled a lot, I feel like I still do, I felt lost a lot and at times I still do, I was afraid and at times, I still am. I was afraid, because I lived through just how fragile life is and so with that, I felt fear for letting myself love again. I was young, it was likely that I would find love again, if I opened my heart again and once I got to a place I was capable of loving another person. Fear also cripples us, it holds us back, it makes us question ourselves constantly. This is the fear we hear within ourselves, but also the fear that others project onto us. The fear inside of me was thinking, “what if this happens to me again”, because lets face it, it could! What would the point be in getting close to someone again? The heartache that could come. The fear projected onto me, was society and peoples beliefs for how I should handle my grief! How I should stay in it for others. People become very uncomfortable with strength, when you don’t fall into some social norm. There is no manual here people. Grief is personal and affects us in different ways. I remember a friend getting me out of the house weeks after John had passed. I didn’t want to leave my place of mourning and safety, but they were kind enough to know, I needed to put my mind on something else even if just for a minute. Escape my reality, even though it will never escape me. We attended a Halloween party and a woman my age at the time cornered me knowing what I had just been through. I didn’t know her, but she acted as if she knew me. She said to me words I remember plain as day. She said “Don’t be afraid to stay at home”. My face I could feel in an instant turn white, what? What should I say? So I mekley said “ok”, while inside I wanted to claw at her. I wanted to say what do you mean by this, explain! Why did she feel the need? Was I asking her for her opinion? No! Had she just lost the person she loved the most in her life, and was now suddenly some expert in grief? No! I was angered and wanted to leave. I was visibly upset and hurt by her words. You see, though what I have learned through this is that people they don’t know what to say, they don’t understand, they can comprehend. They feel sorry for you. You see it in their eyes and you feel it in their words. Words that honestly can hurt you more than help you. Words that sometimes make you feel they are minimizing your loss. When this happens to you, there is no bright side…there is nothing that comforts you and you don’t want to hear how you will be ok someday…because you are not ok. This is not ok. I see that now though she just didn’t likely know what to say. Its simply that people have no idea how they would handle a loss like this, they can’t comprehend it and when it is a young life I think it’s even harder for them to grasp. Any loss is hard though regardless of age. Time! Time shared will never be enough, even when someone has lived a full life, the memories there that were made and the person you mourn who impacted you and had some part in the person you are…it’s never enough. I heard what people were saying when I decided to start getting out. I had to put my shield of armour on. I had to toughen myself in ways I never thought because I was a caring, compassionate and sensitive person. I had decided, I was not going to stay in my house for others, stay in a place where walls and flooding memories were closing in on me. I woke up every day and that was 100% for me at that time, just getting up. There are moments where I feel I lost time, I can’t remember. This is normal. This is real. A piece of my heart, of who I was and am is gone, but does live on through me. Through my sharing and my heart. There was a particular day about a year and a half after losing John that I felt like I woke up. During the time when John passed away, we were living with my parents. We were getting ready to build our home and break ground we had hoped that weekend. After losing him, I went back to work a week later because financially I had to. We were young, we hadn’t planned for this. It helped to put my mind on work, I had so many day I would sit in my office and cry, sob! People were kind though and they gave me my space and they showed their concern and care. Six months later, I was done. I needed a break. I needed to feel, or feel nothing. I just couldn’t pretend. I had to immerse myself in my loss. I had sold the lot that we owned, so I had some money to get me through for a short time until I decided what was next. I moved into a little house, which I quickly became very fond of. My first place living on my own. It was very lonely. It was also very good for me. Skipping forward though, I went back to work about four months later finding a new job. It was somehow easier for me to start new rather than have people look at me with pity, though they may not have been doing that I felt it. I needed to start new or at least as new as I could. So getting back to the day, I feel I woke up. I was upstairs in the finished attic space of my house on a Friday working from home. I went to head down stairs to get some water. I lost my footing and I fell from the top of the stairs all the way to the bottom. It took my breath away, I was balling and the pain was stabbing. Then the next instant shook me. I instantly felt like God was saying “stop”, “wake up”, John was also saying “please stop being so sad”, “live”! It was such a powerful moment for me. I saw clearer and I knew it was time for my re-entry into the life I could have, if I would let myself. I woke up and I started to rebuild. I used to put so much emphasis on what others felt I needed for me. I quickly grew a back bone. I quickly stood up and put a wall around me, protecting myself from others judgments or thoughts for how they now wanted me to live. I was not staying in this place of loneliness and self pity another minute. I have met many widows along the way, I truly feel like god has brought them into my life. They have enriched my life. It does help knowing that I am not alone, even when I thought I was. I see the grace of god in my story, I believe he carried me through even when I did not know he was there. Even when I turned away from him. I’m thankful, I did not turn away for long, but even when I did, I felt his protection. His love. My heart is happy today, though I have so much more healing and life lessons to learn! I have an open heart and am not afraid of living. I’m truly so very thankful Johns gift to me was teaching me that life and love are worth EVERYTHING. Because of this, I opened my heart when I was ready, on my timeframe and no one else’s and I have a wonderful second husband Dave and two unbelievably loving and sweet daughters that show me each day how truly blessed and loved I am. Healing is on-going! Learning is constant. Embrace your journey and honor your loves lost by LIVING!